When you stop to consider what a pioneer in puppetry the late Jim Henson was, it should really come as no surprise that his family members and associates have never strayed far from the craft of animation and quality children’s entertainment. These days the hot ticket doesn’t involve puppets, or for that matter, even drawn animation. 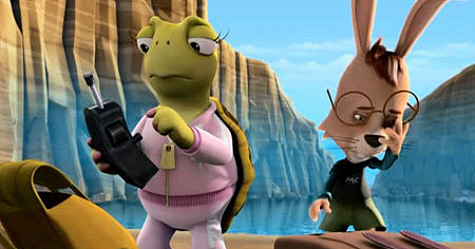 Computer generated animation is all the rage (just ask Pixar) and the Jim Henson Group has been responsible for four entries into the genre at present. Three of these fall under the “Unstable Fables” umbrella and the fourth, being reviewed here, is a solitary piece targeted toward younger viewers. 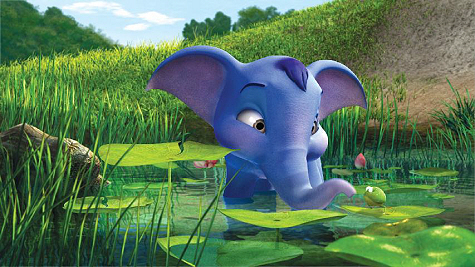 Rest easy if you find yourself wondering why this one failed to wrestle moviegoer proceeds away from the likes of Shrek or Finding Nemo; Blue Elephant was a direct to DVD affair (back in 2008) based on a 2006 Thai-produced film called Khan Kluay. In its native Thailand the film did enjoy theatrical release, not to mention gained status as the highest grossing film that year, and managed to rack up over a dozen prestigious awards in the process. I am known for, among other things, criticizing the act of taking a foreign animated work, dubbing an English vocal track then pawning it off as a new experience in my critiques and it’s not because I suspect the concept can’t work. Rather, traditionally, it hasn’t worked and those seeking verification of these claims need look no further than to Impy’s Island, Dolphin the Story of a Dreamer, The Snurks or Doogal for concrete evidence of just how wrong things can go in the translation process. 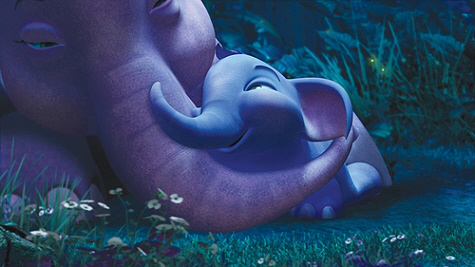 Surprisingly, Blue Elephant is one of the stronger entries to have undergone this exact treatment and while in no danger of threatening Pixar or DreamWorks, the film manages to succeed on multiple levels of entertainment. 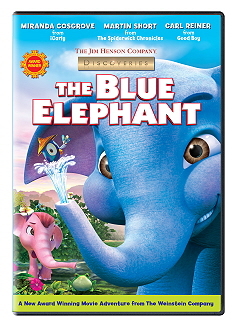 The story thread of the film follows the trials and tribulations of a young, blue-skinned elephant named Khan Kluay as he discovers the world he was born into, longs to meet his absent Royal warrior father, and eventually comes to befriend a Siamese boy prince, Naresuan, who has been ransomed to the Burmese in the process. The will to track down his father is so strong in fact that the young elephant ends up wandering away from the protection of his brood and is soon captured by a Burmese raiding party. This leads to his being separated from his mother as well and his becoming romantically involved with a young pink female elephant. Of course there are numerous subplots about concerning his budding romance with said female elephant, some political turmoil between feuding human nations, and a bit of an attempt at comic relief that never really develops. So here’s where this review is about to get complicated. It is truly quite difficult to pinpoint exactly whom this film targets in its domestic presentation. A majority of the visuals are colorful and overly simplistic, that, when coupled to the flatfoot scripting, affirm suspicions that the goal is to have the film appeal to very young kids. However, the back story is a bit more politically charged than most children are capable of processing and though it’s done tastefully, the visuals become surprisingly barbaric in the later sequences especially, divulging what appears to be a centuries-old rift between Siam and neighboring Burma. The film culminates in a clash of human armies that, no exaggeration harkens to some of the famous battle sequences in Peter Jackson’s Lord of the Rings Return of the King. Make no mistake, the overall message here is quite appropriate for viewers of all ages and there is no real visual violence to be leery of, but individuals expecting the type of age-tested perfection that comes from say, Disney, may be caught a bit off-guard. Visually the film holds up surprisingly well. The characters are a bit on the goofy side with apparent indecision as to whether to super-deform them into comedic proportions or attempt to stick to as close to reality as possible. The background textures are certainly more consistently impressive throughout however and the lighting during the battle sequences is also noteworthy for its ability to establish mood. The language track is passable with a few moments where the potential to derail and sink the credibility of the project that present themselves along the way. Fortunately the actors never cross that line here and manage to keep the prose moving along in a fairly believable manner. I suspect that much of the actor freedom in this particular film stems from the fact that the characters’ mouth flaps are pretty well covered by the presence of their trunks. Had the US crew have to not only translate the material but also match onscreen mouth flaps, there’s a good chance this one would be as disastrous as Dolphin The Story of a Dreamer. In conclusion kids will likely enjoy the clean visuals and simple dialog exchanges here (and potentially come away from the experience having picked up a valuable lesson or two). The political conflicts and feuding nations angle would probably have appealed to adult viewers but in this case only those patient enough to endure the overly simplistic light-heartedness in the foreground. I can state with authority that, thanks to the fact that it does away with the constant tongue-in-cheek attempts at humor found in the three Unstable Fables, this is the strongest entry in the Jim Henson Group stable. While it may not do anything exemplary, it doesn’t commit too many crimes either and when it comes to imported animation projects; that’s pretty high praise indeed. I’ll be the first to admit that the Unstable Fables trilogy didn’t exactly dazzle. There was potential in the plots and a few snickers to be had, sure, but poor pacing, reliance upon pop culture references and pacing that tended to bog down viewers from all age groups resulted in entirely mediocre scores from this reviewer and a logical explanation as to why the franchise as a whole hasn’t really blossomed in this, the era where CG animated features can be expected to easily take in hundreds of millions. That said, Tortoise Versus Hare is by far the strongest offering of the trio while breaking the tradition of using contemporary fairy tales as the source material in favor of reaching way back to Aesop’s timeless fable “The Tortoise and the Hare”. 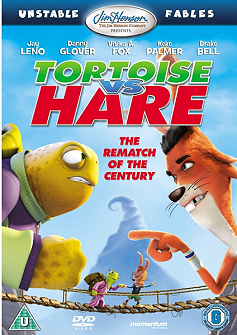 Though if you want to get technical, it’s more of a sequel to the original tale than a retelling as the story is set 15 years after Walter Tortoise’s (Danny Glover) surprising victory in the famous foot race against Murray Hare (Jay Leno). While time has apparently moved on, both parties find themselves obsessing over the events leading up to the overconfident Murray having taken a nap just before the finish line, which, as its told, allowed Walter to slowly cross the finish line first. The victorious tortoise has, ever since, adopted the adage “slow and steady wins the race” in just about any situation conceivable, while the unsuccessful hare goes into bad-memory induced convulsions each time he encounters the phrase. Past their prime and aware of it, both Walter and Murray believe the way to relive the legendary showdown vicariously through their children. A team race is setup to appease the fathers while the uninterested kids agree to participate despite their lack of enthusiasm. Not unlike the formula witnessed in Sony’s Surf’s Up, T Vs H frames its story around the sports documentary format (but does so far less eloquently) that allows for the integration of many pop culture references and puns of varying degrees of success. 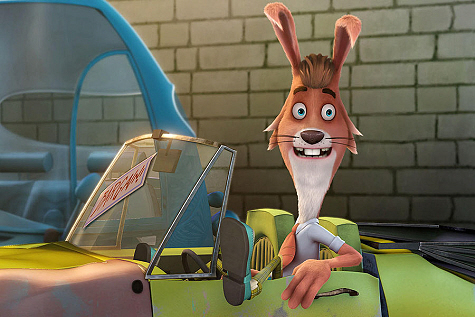 The vocal casting is actually quite appropriate with Jay Leno especially doing a bang up job as the high-strung hare. Pacing is decent but the moral of the story becomes a bit muddled in the 79-minute running time thanks to no shortage of unnecessary character set ups and some heavily dramatized moments of peril during the race itself. It doesn’t flaw the story so much as is overcomplicates the purity of the moral in the name of exciting storytelling. Like all of the Unstable Fables, the film feels a bit overextended by its conclusion. The moments of cleverness and genuine humor lose a bit of their impact against a fairly drawn-out prose. The animation and textures however are surprisingly solid. Not up to par with the big DreamWorks or Pixar pieces perhaps, but not hideously bland either. A solid cast, decent visuals and some honest (if inconsistent) humorous bits all add up to a film that manages to be moderately entertaining. With a bit of more concise pacing and a plot that kept its intentions in tighter focus, this could have been a solid 4-star property. As it stands however, there are simply so many strong entries in the CG animated feature film genre with this falling firmly into middle of the road territory. If you are determined to delve into the Unstable Fables franchise, this one is certainly the most impressive of the three titles that make up this franchise but being the best at so mediocre a series is’t exactly grounds for celebration either. You really have to hand it to the Jim Henson Company for showing incredible adaptability throughout the years. From legendary beginnings in the realm of puppets, it seems only natural for the company to be making use of the current red-hot trend of computer generated animated feature films. 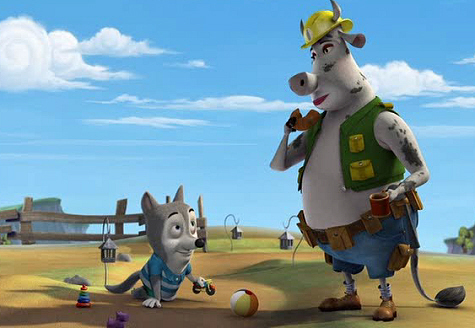 While the big boys like Disney/ Pixar and DreamWorks have proven just how incredible this medium can actually be. 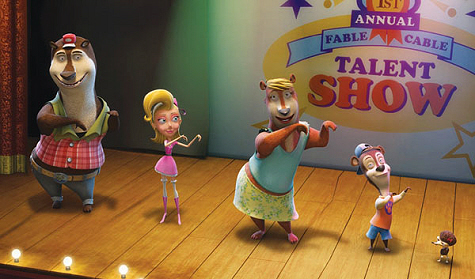 The Henson Group (wisely) isn’t attempting to go toe-to-toe with these juggernauts, but rather entertain audiences of all ages with a direct-to-DVD series they call the Unstable Fables- which essentially spoof classic fairy tales with contemporary references. Yes this is the formula we’ve witnessed countless times in the past (Shrek, Hoodwinked, Happily Never After) but the Unstable Fables really capitalizes on the concept by combining just enough of the original fairy tale to retain the names and locations with a whole lot of pop culture. 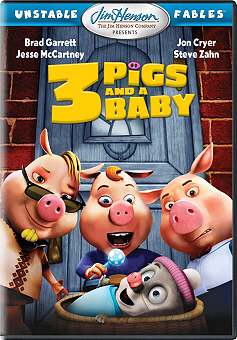 Unstable Fables: 3 Pigs and a Baby was the first animated film in the trilogy and reached the DVD market March 4, 2008. 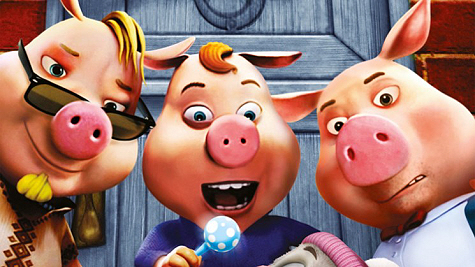 In this new version of “The Three Little Pigs”, the three pigs of various housing material fame become the target of a special-ops team of wolves. When huffing and puffing results in all three pigs cowering in the brick home, the wolves are forced to devise a plan to finally infiltrate the impenetrable house of bricks. What results is the idea to leave a tiny wolf cub on the unassuming pigs’ doorstep. The pigs take the baby in and raise him as their own. The cub grows up among an all-pig society naturally and isn’t made aware of the wolves and their grand scheme until he’s old enough to decide for himself whether he should be loyal to his genetic family or the one that raised him. Even with the type of low expectations that typically accompany straight-to-DVD releases, this one comes up pretty short. The humor never fully develops to the potential demonstrated and the pacing is just askew enough to make this one feel much longer than its 76-minute runtime. The Unstable Fables make it a priority to retain enough of the original fairy tale source material to be relevant despite abundant puns, pop culture references, and heavy-handed moral lessons. Make no mistake, there are a few cute moments and bright visuals will surely hold the interest of the kiddies (for which this film was probably written). Perhaps my criticisms are overly harsh in taking that fact into consideration but the trouble with this one is that DreamWorks and Pixar have shown us just how well the formula can work. As such the dry dialog, mediocre animation, and unclear target age group all come off as a bit more glaring than they would otherwise. Many of the pop culture reference attempts here must certainly have been included to provide a little comic relief for the adults stuck watching this with the younglings, as surely many of the references will be lost on them. In all, I found this one a slight improvement over the franchise’s take on Goldilocks and the 3-Bears but it is still a full tier below the better entries of the big animated studio houses. There’s potential here and some genuine creativity sprinkled about but the overall delivery of all of the pieces comes off as an entirely mediocre effort. Unstable Fables: Goldilocks And The 3 Bears takes the idea of the blond-haired girl who breaks into the home of three porridge-eating bears to a whole new level. 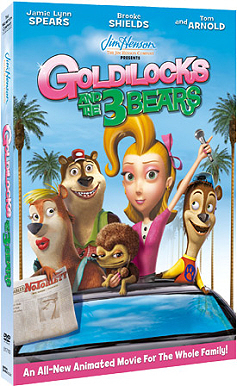 Goldilocks, voiced by Jamie Lynn Spears is portrayed as a spoiled television starlet and host of a home renovation show called Fab Rehab. The three bears, in this case a lower working class family consists of Mac Bear (Tom Arnold), Ruby (Brooke Shields) and Junior Bear (Colton Parsons). Junior sends a submission tape to the show Fab Rehab and Goldilocks, in effort to gain publicity, selects the bear’s house as the next remodel. In an odd move, she and her crew remodel the home in edible candy. A bee attack destroys the candy house and poor Goldilocks discovers that the disaster results in the cancellation of her show. Desperate to get Goldilocks back on television and to collect a cut of her pay, her manager (literally a weasel) pitches a new reality show that would put Goldi in the bear’s house while they try to resume a normal life; with cameras filming their every move. If all of this sounds intriguing to you, I can attest that there is a bit of charm contained within even if the plot structure itself is a bit sloppy and heavy-handed. The humor alternates between a virtual overload of pop culture references (The Dixie Chickens, Rachel Raven Show, American Idol-style talent show judge Simon Owl and so on) and slap stick. The formula, presumably, is to offer the parents something to giggle about while simultaneously giving the kids the type of in-your-face silliness that’s expected in an animated piece. The trouble is neither source of amusement is ever fully developed here. Adults will find the modern references cute (but by no means hysterical) and the slapstick is a bit too few and far between to keep a young child glued to the screen. This situation is slightly further compounded by the plot, which takes a few unnecessary twists and turns to be considered concise by any age group. Examples of this include the fact that the story would probably be much clearer if it followed one of the bears mainly and allowed the viewer to fill in the gaps of the happenings of the others on their own (as it stands we go to work with dad, school with Junior, auditions with mom and even closely follow Goldilocks in her home life). Another example that comes to mind is the whole concept that we need to follow along while Goldi hosts the home makeover show, only to get canned, then begin the reality show bit. One can’t help but assume it would have flowed much smoother to simply begin with the reality show angle. On the other hand, the visuals are bright and clean and the humor is always any-age appropriate. It’s a safe bet to say that younger kids would get a kick out of this one even if there are better examples of the medium out there, many of which occupy the same store shelf.